Book your luxury, comfortable room at Hotel Kyriad Laon. This designer, 3-star hotel is your gateway to the medieval city, located just 3 kilometres away. Make yourself at home in your contemporary hotel in Laon and appreciate the new, stylishly-renovated interiors. Relax in our rooms with luxury ensuite bathrooms. Hotel Kyriad Laon is unique for its well-equipped gym and cosy lounge. You are ideally situated, just 3 kilometres from the medieval city, or try an adventurous day out at Centre Parcs, 25 kilometres away. 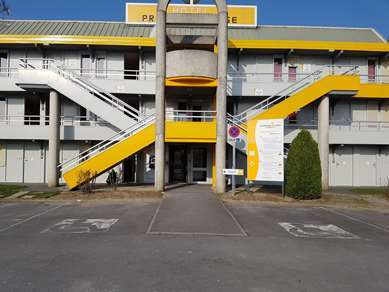 Accessibility Make the most of the close proximity to Laon train station 3.5 km away. Your Laon hotel has been recently refurbished, with all rooms included in our beautification project! Guests can now stay in one of our originally decorated and contemporary rooms. Enjoy the luxurious bed linen and memory-foam pillows. You will fall for the spacious ensuite bathrooms, making your stay in this 3-star hotel as comfortable as possible. Staying at Kyriad hotel Laon is a uniquely enjoyable experience, offering guests comfortable rooms, a lounge to relax in at any time of day or night, as well as a gym for ultimate luxury. This hotel offers 47 rooms, all fitted with deluxe facilities. Two rooms are accessible for guests with reduced mobility, including external access. Each morning you can take advantage of a self-service buffet in the restaurant for a nutritious breakfast! Secure, comfortable with a laid-back, friendly atmosphere, our Laon Kyriad hotel offers you all the amenities and services with your well-being in mind.